This wicked heatwave makes the skin weap thick tears and a swim in the cooling sea is the best option to get through the day. Water is the drink to survive, but besides water, a glass of ice cold ouzo can also be a solution to beat the tiring heat. Ouzo is the national drink of Greece, although late into the night a bottle of whisky may well appear. Lesvos is the ouzo capital of the country because it produces the most (and the best). It is a relatively new drink, just as the famous Greek tomatoes were only lately introduced to the Greek kitchen. Only around 1900 the real ouziotary broke out, a welcome replacement for the unhealthy, but popular (especially in France) drink absinth. In 1860 Varvayannis brought his art of distilling from Odessa to the island. Additionally, during the population exchange between Turkey and Greece in 1923 many Ottoman Greeks brought distillation secrets with them. You may wonder about the fact that in the Ottoman Empire alcohol was consumed. It indeed was a muslim empire, but there were so many other gods worshipped that alcohol was easy to find. Moreover the foreigners had to pay a pretty high tax for their alcohol (Müskirat resmi): no sultan wouldn't miss that. And Sultan Selim II (1524-1574) did love a glass of very good wine; he was even called The Drunkard. Not only did his lordship reign drunkenly over his huge nation, but the father of modern Turkey, Kemal Atatürk, could also be seen more than once a day with a glass of raki in hand. His daily consumption of the precursor to ouzo is estimated at a liter a day and he finally died in 1938 due to liver cirrhosis. Even though the coming sultan Erdogan makes life difficult for drinkers, the national drink of Turkey remains raki, distilled from the grape skins left over from the wine pressing. Those banished Ottoman Greeks that fled to Lesvos used century old procedures, but the alcohol on the island was enriched by plenty of local herbs. When driving southwards, around Lisvori you may see the ‘ouzo-fields’: anise, dill, cumin and grains, which are only a few of the many ingredients each ouzo producing family uses, each scrupulously guarding its own secrets. Even if you visit the ouzo plant of Varvayannis in Plomari, you will not find the secret —just learn a bit more about their production and history. Also the E.V.A. that runs a little ouzo museum in Mytilini, will not reveal any recipe. 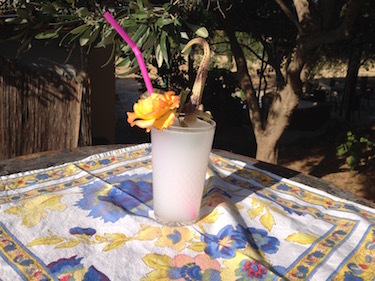 The little booklet they produced – Lesvos insider – only gives away the secrets of the ouzo-island life and tells you how to make mastic-cocktails. Lesvos is ín, Ibiza is out, was recently written in a Dutch magazine (Wow, the New World). You can see it coming: the organization of the Symbiosis Lesvos Arts Festival is in full swing, the high-profile disco oXy between Molyvos and Petra has reopened. Skala Eresou with its many cocktail bars and fancy visitors, and Vatera with its huge beach and hip beach bars, are ready for a hot summer. Also many youngsters are going to the more unconventional beaches like Drota, Makara and Crousos. So ouzo is ín, sangria (or all those other colourfull cocktails) are out. Poor some water into the ouzo, fill the glass up with plenty of ice cubes, and together with some mezèdes and friends it will be the best remedy to the heatwave and the best way to enjoy the island that offers plenty of paradise-like holiday experiences.